When you choose an awning from Hillarys, you’ll benefit from specialist advice and fitting from a team of experts. Here’s a little bit more about what you can expect when you arrange an in-home appointment with a specialist awnings advisor. 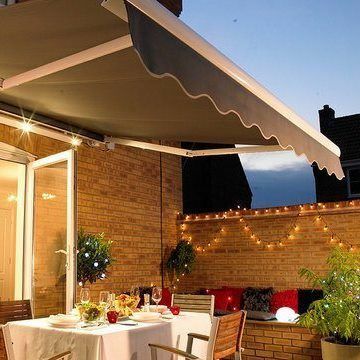 An awning is a wonderful addition to your outdoor space, providing an attractive and practical feature that allows you to enjoy spending time in your garden throughout the year. Unlike a gazebo or summerhouse, an awning takes up no floor space, so is particularly useful if you have a limited amount of outdoor space, or if you want to seamlessly extend your indoor space into the garden. It’s important to get the size of your awning absolutely right because it will affect the area of shade it provides. During your in-home appointment, your advisor will carry out a technical survey to calculate the exact surface area needed to provide complete shade as the sun moves across the sky throughout the day. As part of the technical survey, your specialist advisor will take precise measurements of your space, giving you complete peace of mind that your awning will be just the right size. Your advisor will then return to fit your awning along with any optional extras you have chosen. All of our awnings are made from water resistant fabrics which are specially treated to help prevent fading and weathering. Behind the scenes we have a specialist technical team who subject each fabric to extensive testing and only approve fabrics once they’ve met our stringent technical requirements. During your appointment, your advisor will bring our stylish range of striped and plain fabrics to your home, so you can find the perfect style for your space. There are lots of innovative options available to help you enjoy your awning throughout the year. For ease and convenience all our awnings come with motorised controls, allowing you to operate your awning all at the touch of a button. Add intelligent sun sensors and your awning will automatically open when the sun is at its peak. And with vibration wind sensors also fitted as standard, you can rest assured that your awning will safely retract into its cassette if the weather becomes too blustery. To get the most from your awning, choose integrated heating and lighting so you can enjoy al fresco dining even on the chilliest evenings. Your advisor will talk you through all the options and install your selections when your awning is fitted. Best of all, our awning fabrics and parts come with a 5 year supplier warranty, with an additional year’s cover provided free of charge by Hillarys. So you can rest assured that your Hillarys awning will look great and withstand the elements now and in the future.